Beer Gardens called Biergartens in Germany are an integral part of the German culture and to many Germans, it wouldn't be summer without a cold beer in the shade of the chestnut or linden tree, surrounded by the lively company of friends and family. Today, beer gardens can be found in many major cities of the world as they offer a fun, friendly and affordable place to enjoy a cold beer in the hot summer heat. Duke of Bavaria Albrecht V in the mid 16th century, outlawed beer brewing in the summer, between the feast of St. George (April 23) and St. Michael's Day (September 29) because there was a drastic deterioration in the beer quality during the hot summer weather. This meant that beer could only be brewed from autumn September 29th to spring April 23rd, which influenced the production of bottom-fermented beer using yeast capable of fermenting in cold temperature. Beer needed to be stored after fermentation and aged for a few months in cooler temperature, so it would be available for the summer. This was an era before refrigeration, so breweries built large underground cellars for storing beer. This practice was called 'lagern' in German which meant 'to store', and therefore these bottom-fermented beers are called lagers. The practice of consuming beers on premises naturally followed. 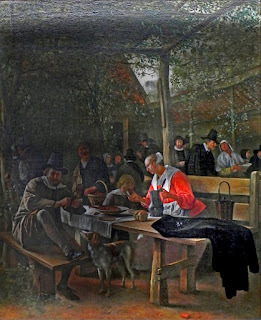 From Jan Steen's (1626–1679) painting titled Der Wirtshausgarten (Tavern Garden) which was made around 1660, it is evident that breweries were beginning to better utilize their premises to serve beer and food to its guests. These underground cellars were covered with gravel, and chestnut trees were planted to provide additional cover from the sun. Gradually after that, selling beer in a pleasant shaded setting emerged. Simple tables and benches were set up on the grass under the shade of the trees during summer, serving beer and food, hence creating the 'beer garden' we know today. 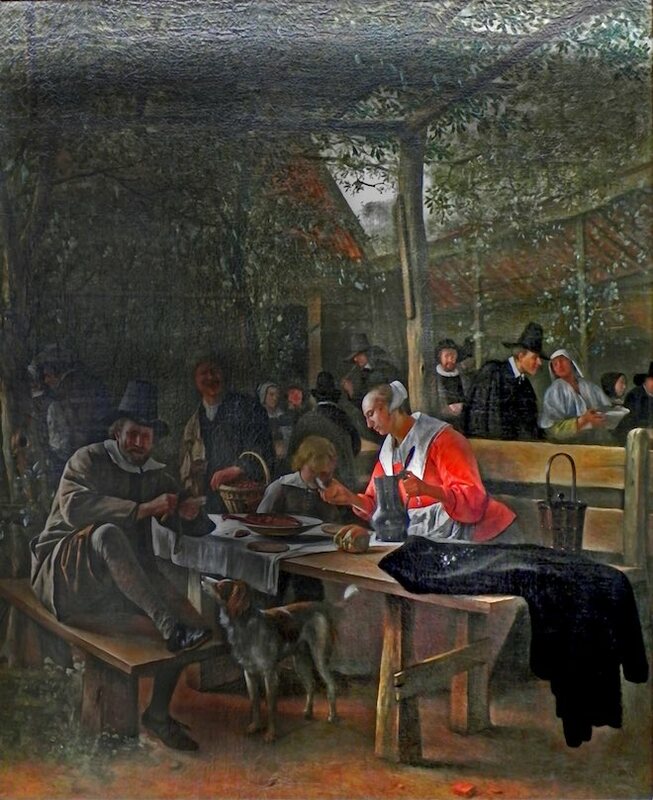 Food service at the beer gardens caused smaller breweries and food serving establishments to petition King Maximilian I to forbid the selling of food, as they found it hard to compete. In compromise, beer gardens allowed their guests to bring food, a common practice still followed today. The beer gardens had soon spread across Bavaria and other parts of the German empire. 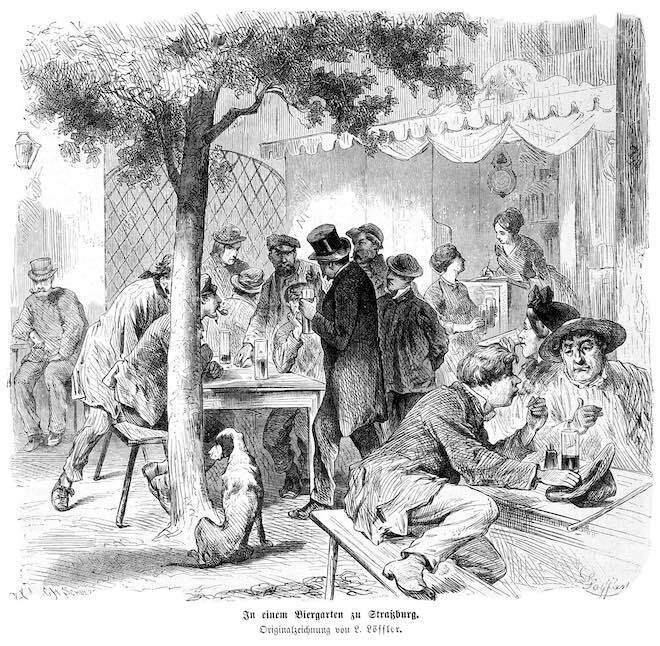 An image from Die Gartenlaube journal in 1872, based on an original drawing by Ludwig Löffler (1819–1876) shows a beer garden in Strasbourg, which was then a part of the German Empire. Though beer gardens first originated in Bavaria, they also spread across other cities in Germany and adapted to the local brewing culture. In Cologne, the local beer Kölsch, is served at the beer gardens. 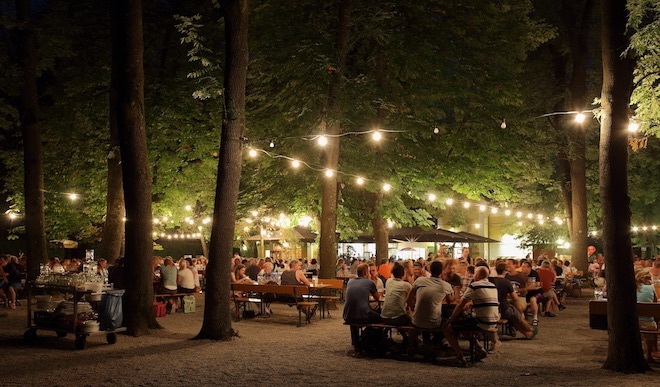 The oldest beer garden in Cologne is the Hellers Volksgarten which dates back to 1891. Located on a small lake in the middle of the park, it used to be a popular tavern and meeting point for the Cologne residents. Germans are stoic people who strive for structure, perfection, punctuality and precision in all aspects of their lives. Often their attitude may seem unfriendly and aloof, but they have a keen sense of community and social conscience, and passion for enjoying life’s simple pleasures of food and drinks with family and friends. 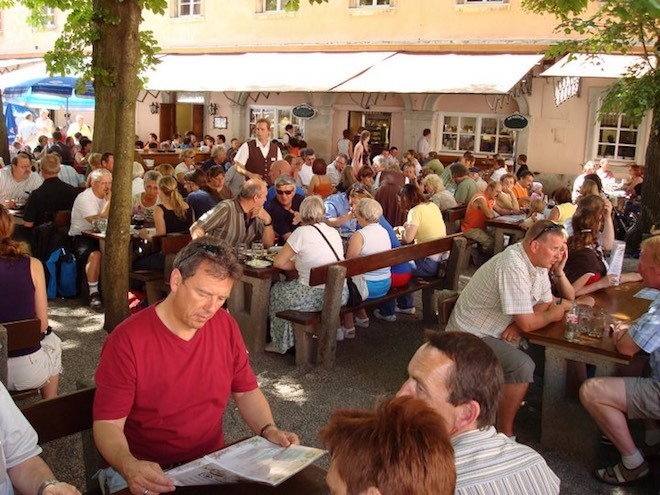 Beer Gardens offer a great alternative for many Germans to take a break from their daily routines and rigidity of structures to enjoy beer and food in a fun, relaxed communal setting and engage in lively conversations on different topics of interest. 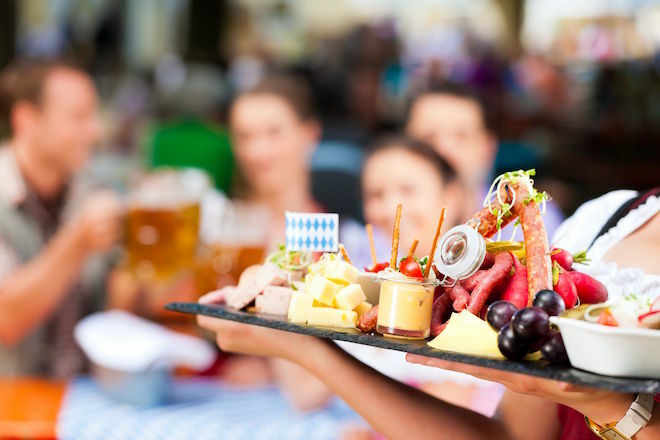 When it comes to beer and food, Germans enjoy savoring it at their own relaxed pace, breaking away from the punctuality and precision of their daily tasks and work ethics. The popularity of beer gardens has also been spreading around to many cities around the world, as it fosters a strong community spirit and culture with a vibrant and fun atmosphere allowing people to enjoy a cold beer on a hot summer day. A visit to a beer garden while visiting Germany should be on the list of any traveler that enjoys experiencing different cultures and seeking new experiences. 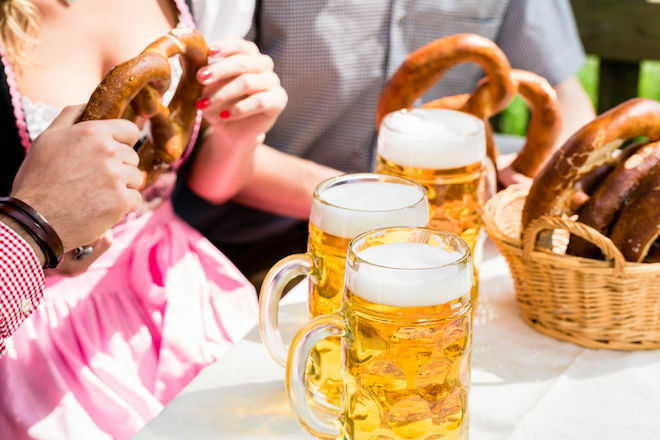 Though Munich is well known for its annual Oktoberfest celebrations, it also has many historical beer gardens that will allow you to experience the centuries-old history of brewing and the local Bavarian spirit and culture of enjoying hot summer days with beer and some hearty German food. 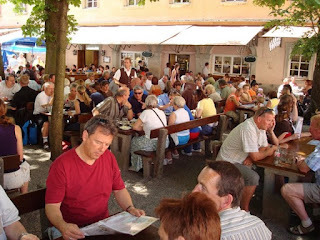 The traditional food served at the beer gardens in Bavaria include Radi (spiral-cut radish), Obatzda (cheese spread), Brezel (pretzel), halbes Hendl (half a grilled chicken), Schweinshaxe (pork knuckle) served with Bratkartoffeln (German fried potatoes), Steckerlfisch (grilled fish on a stick) and Schupfnudel (potato dumpling) served with sauerkraut and bacon. Bräustüberl Weihenstephan and beer garden is located on the Weihenstephaner Berg, a hilltop next to the Weihenstephan Brewery in Freising, about 40km north of Munich. In 1040 the City of Freising gave the Benedictine monastery license to brew beer for sale to the public, which is why that year has been claimed as the foundation date by the Weihenstephan brewery, making it the oldest existing brewery in the world. The monastery which has survived many disasters including fires and earthquakes is now a property of the Bavarian state. The brewery has continued the centuries-old tradition of making the Weihenstephaner beers. Today, it is part of the Technical University of Munich, and known worldwide for its brewing technology and state-of-the-art production facility and training center. The beer garden is known for its great food and beers besides offering a beautiful view of the surrounding area. It is also known for being the birthplace of 'Obatzda' a classic Bavarian beer garden cheese spread. It was created by Katharina Eisenreich, the innkeeper at the monastery from 1920-1958. Weltenburg Abbey brewery in Weltenburg near Kelheim on the river Danube in Bavaria has been in operation since 1050. 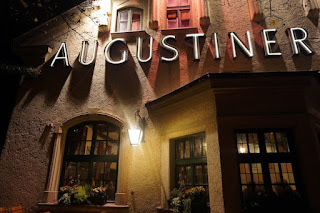 The beer garden is located in the inner courtyard of the abbey complex and offers traditional Bavarian menu which includes the abbey's cheese and beer. The brewery is no longer run by monks, having been taken over by a private local brewer, but keeping with the traditions of the historic monastic breweries, they specialize in dark malty beers that were created to nourish the monks through the fasting period. Their Weltenburger Kloster Barock Dunkel was given the World Beer Cup award in 2004, 2008 and 2012 for the best Dunkel beer in the world. 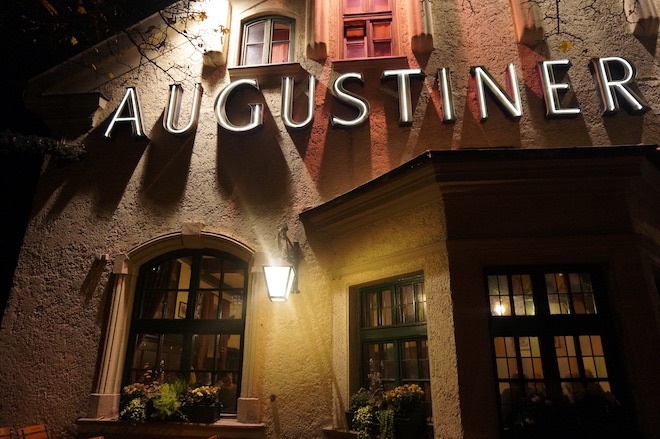 Augustiner-Keller is one of the oldest beer gardens in Munich being first listed on the city map of 1812. The beer garden with its canopy of chestnut trees, is a great place to enjoy an Augustiner Edelstoff beer straight from the wooden barrel. The strike of a bell marks the announcement of the opening of each new barrel. Like most beer gardens, in addition to a serviced area there is also a self-serviced area where guests can bring their own food. The old cellar which was built eight meters below ground to store beer, offers a cozy setting to enjoy beer on cold rainy days.